Tokyo’s hot and humid summers are when some department stores open up their rooftops to open-air beer gardens. It is an unusual setting, especially in Shinjuku when you surrounded by skyscrapers, but a fun experience. If you are lucky the winds will blow across the building to cool you down a bit. The food is typical pub fare of sausages and fried potatoes served with cold beers, a casual atmosphere, and a unique insight to part of the drinking culture of Japan. Call ahead to make sure that the department stores are running their beer gardens. These are usually in July and August. Popular ones include Keio in Shinjuku, Matsuya in Asakusa, Tobu in Ikebukuro, and Matsuzakaya in Ginza. 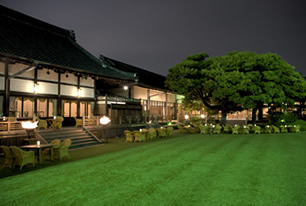 This may be one of the most spectacular beer gardens in Japan. Guests are seated in wicker chairs around a manicured garden it looks like it was tended to with tweezers. It is luxurious and a rare treat in this concrete city.